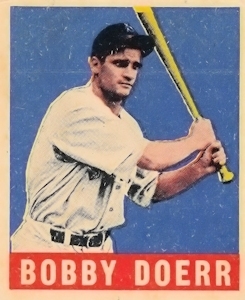 ON THIS DATE (May 12, 1948) ... Bobby Doerr smashed a three run homer to give the Red Sox a 10 inning, 6 to 5 victory at Fenway Park. Everyone in the crowd of 8267 knew where the fastball from pitcher Earl Harrist was headed, once Doerr made contact. It landed somewhere over the screen in left centerfield. White Sox leftfielder Bob Kennedy tossed his glove in the air as he watched Ted Williams and Wally Moses lead Doerr across the plate. Williams had walked and Moses had singled in front of him. The catcher, Ralph Weigel, stood as though petrified, as Harrist walked slowly toward him. It was fully a minute after Doerr across the plate that the pair finally headed for the White Sox clubhouse. They may have been wondering if they would ever win a game, after having tossed away their two run lead in the opening half of the inning, made against Sox reliever Denny Galehouse. Three singles in the second inning had put the Red Sox ahead, 1-0, but the White Sox got two runs in the fourth to give them a 3 to 1 lead. Orval Grove, their only full game pitcher of the year had pitched well. He passed Birdie Tebbetts to open the 7th inning. Billy Hitchcock ran for Tebbetts and then Wally Moses singled to right. Stan Spence, out of the lineup because of a recurring leg injury, came up to pinch-hit for starter Mel Parnell, and singled sharply to right with Hitchcock stopping at second. Dom DiMaggio attempted to sacrifice but Weigel was able to force Hitchcock at third. Then Johnny Pesky grounded out to Floyd Baker at second. With men on second and third, the question of putting on Ted Williams with the winning run, faced manager Ted Lyons. He allowed Grove to pitch to Williams, and Ted singled through second to score both runners and tie up the game. To add to the White Sox worries, Williams promptly stole second base. It was his first stolen base in three years, probably occasioned by the threat of a thunderstorm. Stephens then singled sharply to left, but Williams was cut down at the plate on a fine throw by Kennedy. The 10th inning found Luke Appling starting with a base hit for Chicago. He was sacrificed along by Weigel and Taft Wright hit a long fly to center which DiMaggio grabbed close to the Red Sox bullpen. Dave Philley was then purposely walked, but Kennedy doubled off the left centerfield wall to score both runners and give the White Sox a two run lead. Cot Deal replaced Galehouse for the Red Sox and intentionally passed Michaels, and then got Harrist to ground out. Deal threw but five pitches in his relief role and was given credit for the victory.